My 8 year old always looks forward to Halloween. He likes to dress up but not as something too scary, just in case he freaks himself out!!! We don’t do face paint either, because it means having to wash his face after and water on his face is the end of the world!!! For the last few years we’ve always been trick or treating with his cousins but now we have moved away. We are waiting for him to get a school place at the local school so as of yet he hasn’t made any friends. 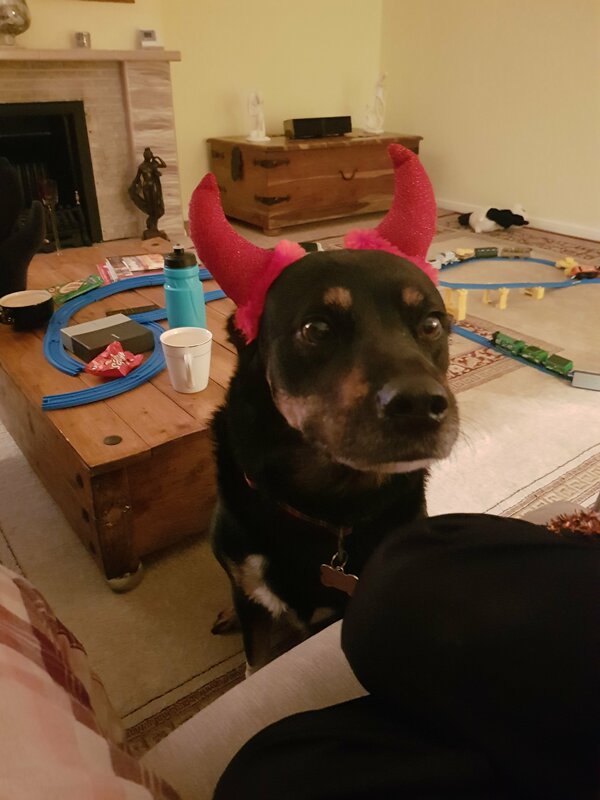 He decided he didn’t want to go trick or treating this year as he didn’t know anyone but wanted to dress up at home. On Halloween he put on his vampire costume and cape and devil horns and filled his bowl with sweets and sat and waited. We waited and waited and then the doorbell rang. The dogs went nuts as always, we quickly shoved them in the kitchen and grabbed the sweets. We opened to the door to find the Yodel delivery man standing there grinning. My little vampire was not happy so off he stropped. The delivery driver on the other hand was more than happy to take a sweet!! Again we sat and waited for another couple of hours. I painstakingly tried to explain to Harry how maybe the the children thought the little old lady still lived here and they shouldnt knock just in case they scared her. Molly, the dog, agreed. She was never one for dressing up. 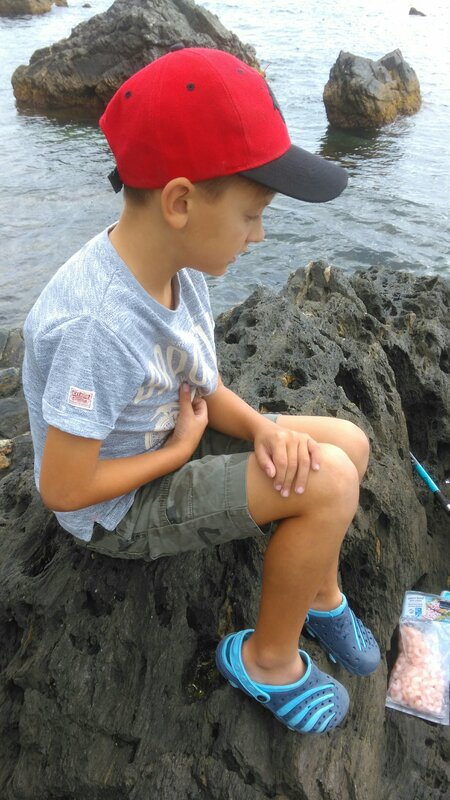 How not to fish with an 8 year old…..
So…… Our last weekend before leaving Spain, what should we do?? Given that the sun shines here most days, today of all days started out pretty cloudy. That ruled out a day at the beach. Something I could easily have done. Other options included a trip to the skate park, shopping, or just generally getting out of the house. Out came the beginners rod set bought earlier in the year with a promise of we’ll go fishing when we can blah blah blah , however I think this must have been its second outing. It had been hidden in the top of the wardrobe to stop small children taking each other’s eyes out with the fishing hook and thus forgotten about. Anyway…. Not wanting to be a party pooper off we all went once the rod had been untangled due to an impatient small boy wanting to fish before we’d left the building. We needed bait. Mercadona here we come. My husband says just buy a handful of unpeeled small prawns off the fish counter. Off I went only to find large prawns complete with heads and legs were the only option on both the fish counter and the fresh fish shelves next to it. I retreat back to the car where Harry shouts out the window ‘What happened then?’ Like something had gone on!! ‘They only had prawns with heads and legs’ I said. I hadn’t been given an alternative so I gave my husband his wallet and off he went determined to of course prove me wrong. Whilst waiting in the car Harry and I discussed fish. 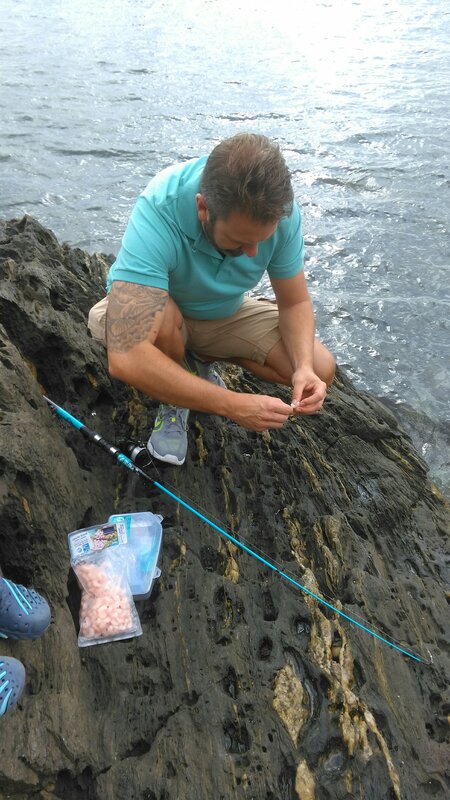 ‘ Where do Mercadona go fishing’ he asked. ‘They don’t do the fishing, you see all the boats at sea don’t you?’ I replied. ‘ Yes ‘ he said. ‘They do the fishing and sell them to Mercadona and then we buy them.” I told him. ” Oh , ok so how do they get the fish in the fishfingers then ?” He asked. As I explained how this happens my husband returned with a pack of frozen prawns. Thank God I hadn’t had a blonde moment and totally missed them on the fish counter. 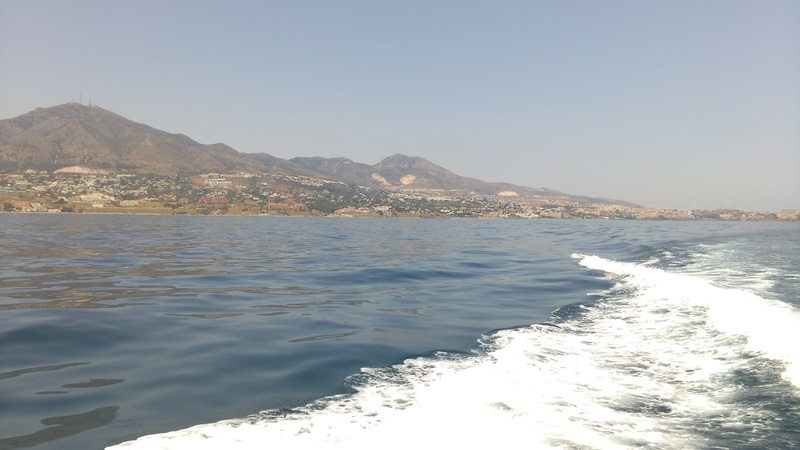 We were off, finally we reached the preferred fishing destination. Not far from the house. I wondered how long this expedition would last. Probably not long for several reasons. I was right, we pitched up on a rock that according to Harry looked like a jet ski. We sat while my husband set up the rod. Harry and I attempted to set up the selfie stick. We failed of course as my phone wouldn’t connect with it. My husband was setting up the rod whilst moaning that the bait probably wouldn’t stay on the hook because it was frozen. SO WHY DID HE BUY IT!!!! An early get out clause me thinks!!! Prawn one was launched and we sat and waited. ” Lets play eye spy?” Said small boy. “Really, is there nothing else” I said. Eye spy was forgotten about as the reel came back in having lost prawn one. After a deliberation, as to which would stay on the line, prawn 2 was launched. 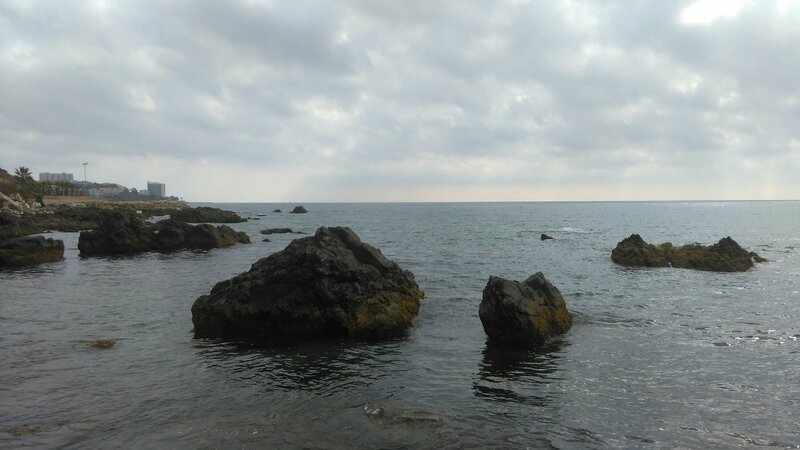 We sat, we watched 2 women collecting shells. 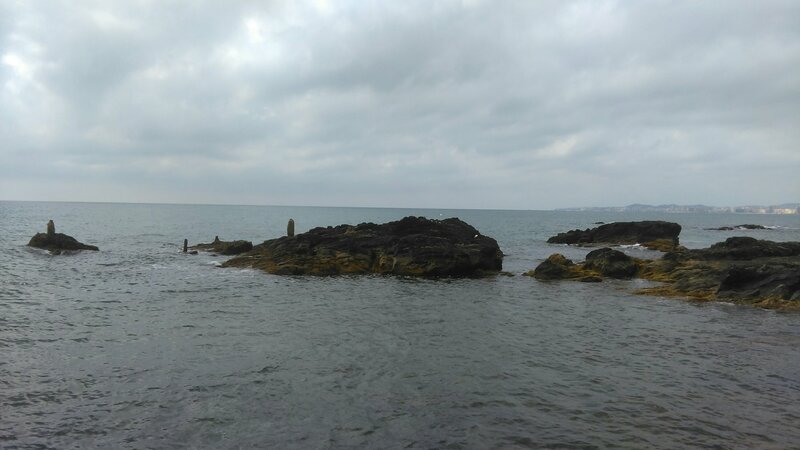 We discussed whether we should move as the rock we had climbed over to get to the ‘jet ski’ was getting covered with water. In came the reel again. Prawn 2 had of course also fallen off. “This isn’t going to work, I knew this was a mistake” my husband said. SO WHY DID YOU BUY THEM!!!! Prawn 3 was the final choice as if this didn’t stay on that was it, game over, fishing trip done. Half an hour killed. Prawn 3 was launched. We sat and waited. This time we discussed the paddle boarders we could see and how far out they were. “Do you reckon you could get them with the fishing line” said Harry. The reel came back in, prawnless, as expected. “Right that’s it, I’ve had enough” said my husband. Off we trundle , back to the car. Debating where to go for lunch. Another big decision. Living in Spain for the last year or so has be quite an eye opener. There are of course huge benefits to living here, one being the nearly year round sunshine you experience and one of my favourites is the added bonus that you can wash and dry your laundry in one day. No need to drape it round the house like a Chinese laundry!!!! 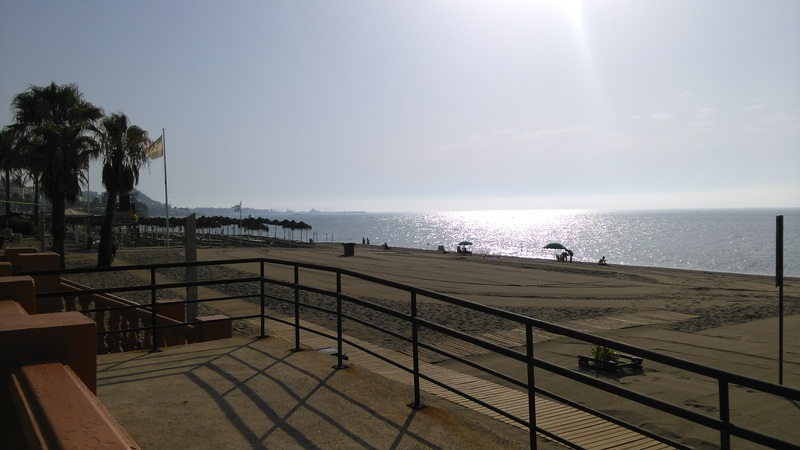 But aside from the continuous al fresco dining and the glorious walks along the paseo there are downsides to living here in Spain. 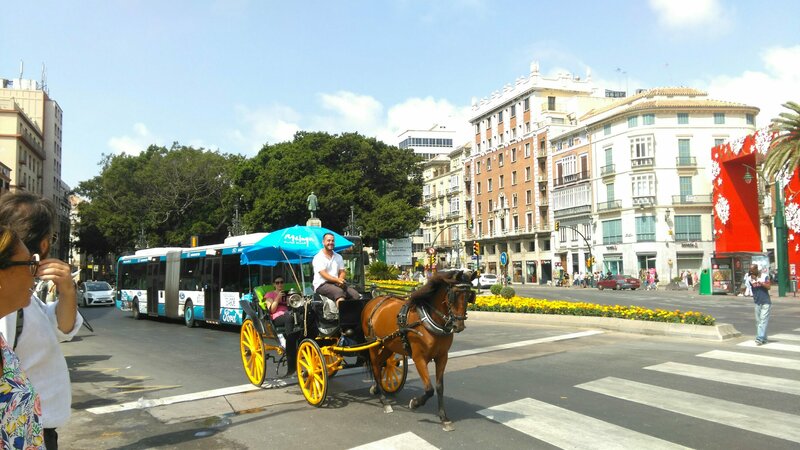 Driving – The Spanish cannot drive, end of story. There is a massive confusion for them over which lane they should be in regardless of the situation. Any opportunity to cut you up and they will. Indicating is non existent. They are unsure as to what the stick thing on the steering wheel is actually used for thus they don’t bother. This is most infuriating for any other driver who has an ounce of highway code knowledge in their head. I don’t remember guess work being in that manual!! 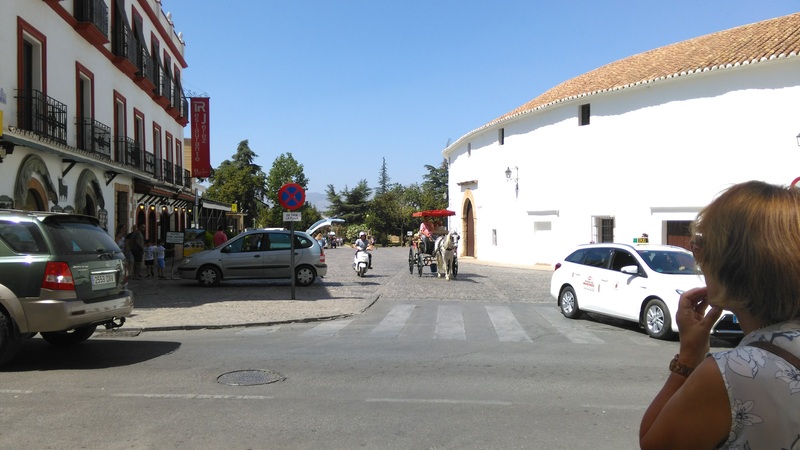 Parking – according to any Spaniard the lines are not there to separate their car from yours. It’s perfectly acceptable to use them merely as a guide and park diagonally across them. My favourite parking skills come from the parents at my child’s school. It’s like a scene from wacky races, particularly when school has finished. There is no need to park in a space or in the car park when the chevrons and the round abouts arcs perfectly acceptable places to ‘dump’ your car. Driving slowly – the Spanish don’t drive fast, however they do know how to drive incredibly slowly. Making any journey along the coast road take at least 15 minutes longer than it should do. In Spain its illegal to drive with flip flops on, no t-shirt on, your arm out of the window and your music too loud. It is however perfectly ok to drive whilst talking on your mobile, stop anywhere in the road to park your car as long as you have your hazards on or not really be too concerned about whether your child is strapped in the car seat. In Spain nothing g is straightforward. There is a mound of paperwork for everything. Everything you do requires 50,000 signatures and heaven forbid you lose your bank card. You cannot change anything over the phone, order a new card update any phone numbers etc. You have to go into the branch at which you opened the account. Highly inconvenient and annoying. The Spanish are extremely loud. You will know instantly who is what nationality. The Spanish cannot hold a conversation at normal decibel level. Shouting is the only way to get their point across. Dog poo!!! Pick it up , omg the volumes of dog poo in the area I live in is disgraceful. It’s laziness. Get a bag, any bag, pick it up. Rubbish bins – they can walk their rubbish to the bins but rather than lift the lid and put it in they dump it on the floor. This then creates a new problem when the stray cats come out and rip the bags to pieces. I’m sure I’ll think of other things to add to this as I’m moaning about them. 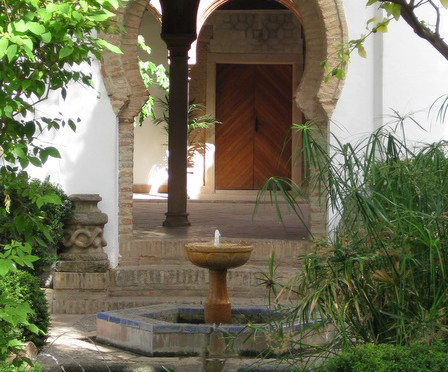 Malaga is a glorious historical city with plenty of sightseeing to be done. I went for the day and only covered a small part of what there is to see, however I still crammed a lot in. For a Sunday afternoon the city was buzzing with life. 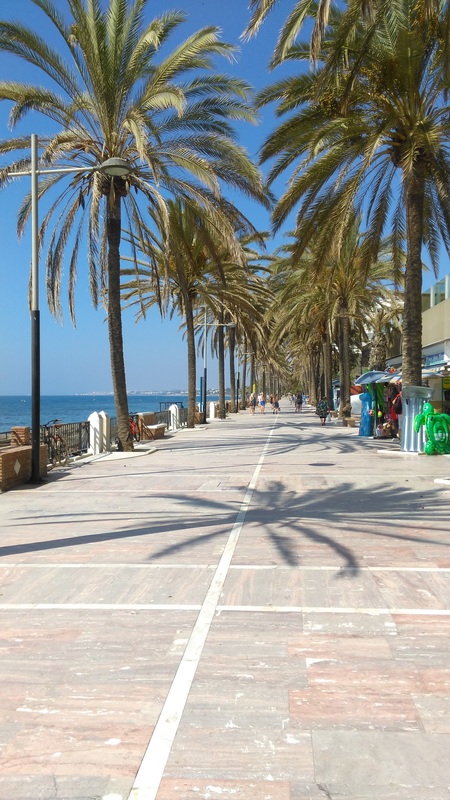 We had caught the train from Benalmadena which took 30 minutes into the city centre. 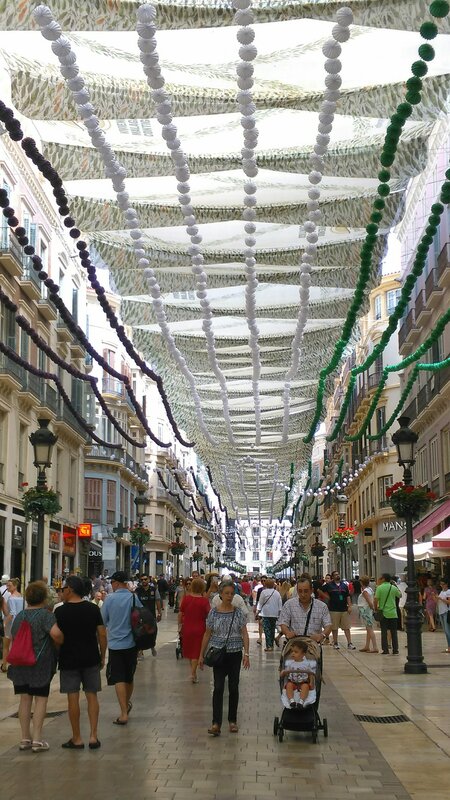 The Feria had recently been on and the streets and bars were decked with colourful bunting and hanging lanterns. 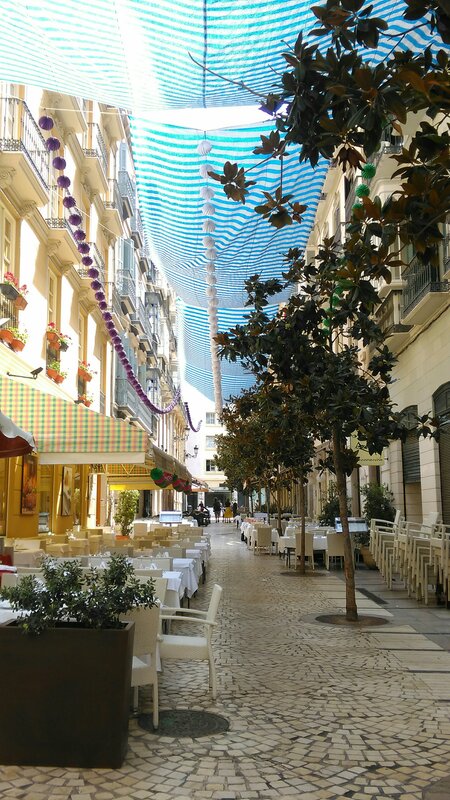 We started our wander through the Marques de Larios shopping precinct. 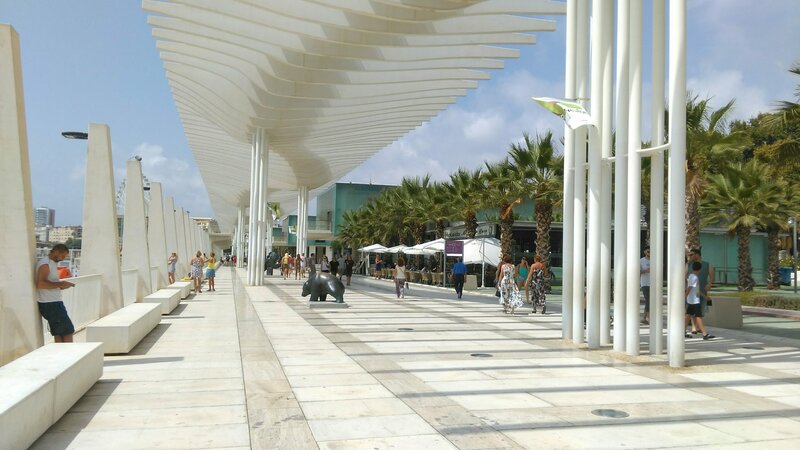 Here there is plenty for everyone, with boutiques, high street chains and bars and restaurants galore. 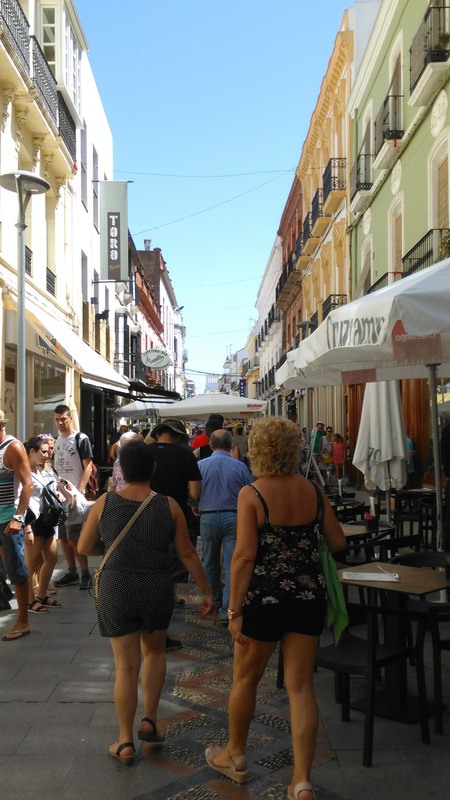 The side streets lead to small independent shops and then onto small plazas with tapas bars offering a great selection of food and drinks. 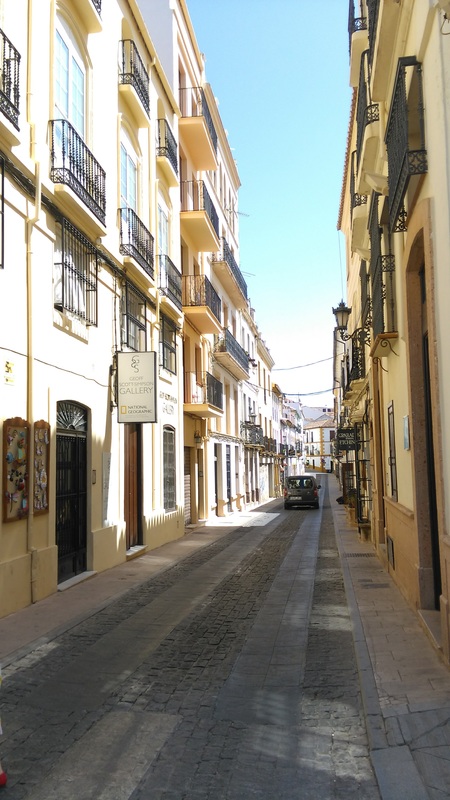 From here we wandered through back street to the Cathedral of Malaga. 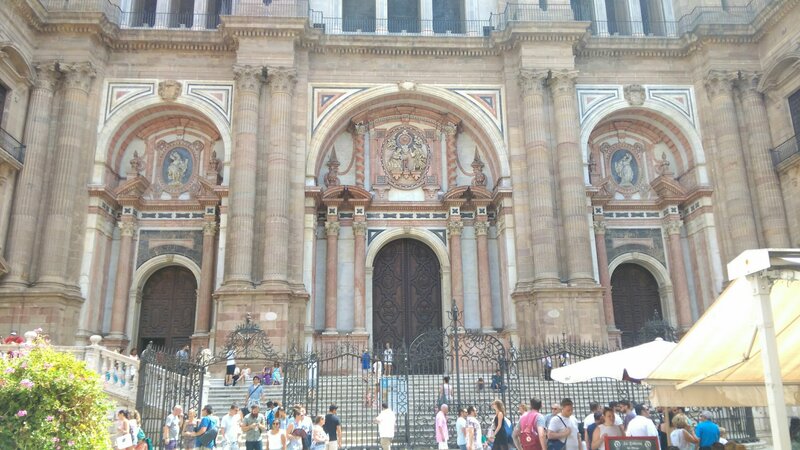 This is a Roman Catholic church built between 1528 and 1782 in the Renaissance Architectural tradition. You have to see it to appreciate it’s splendour. My photos don’t do it justice. 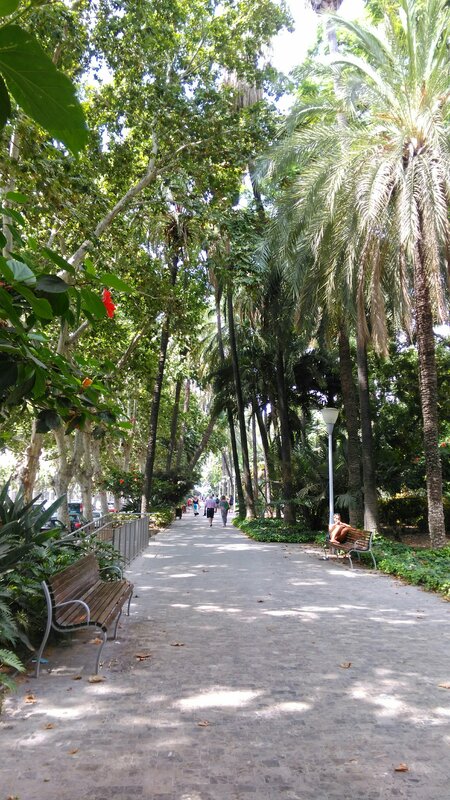 We continued down through the Paseo Parque which runs along the harbour. 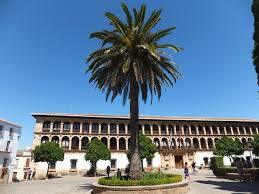 It is shaded by Palm Trees and Plans Trees and full of fountains and sculptures. 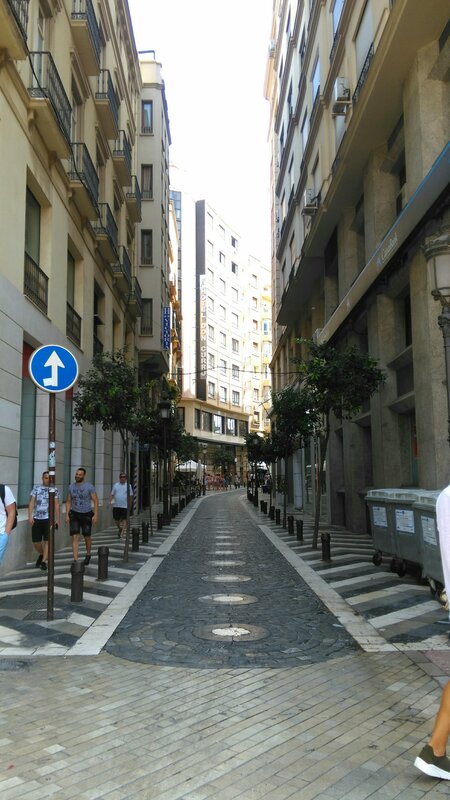 On the other side of the road is the Paseo de Espana, running towards the Centre Pompidou along side the harbour.This is a commercial area with shops and bars where going and old Malaguenos come to socialise. Rather than keep walking on we decided to walk back towards the Centre as the sun was hot and we were roasting. Looking into Malaga from the harbour edge you can see various land marks. 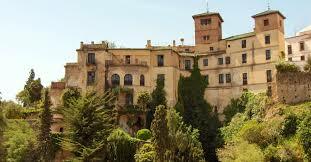 Firstly is the Castillo de Gibralfaro. 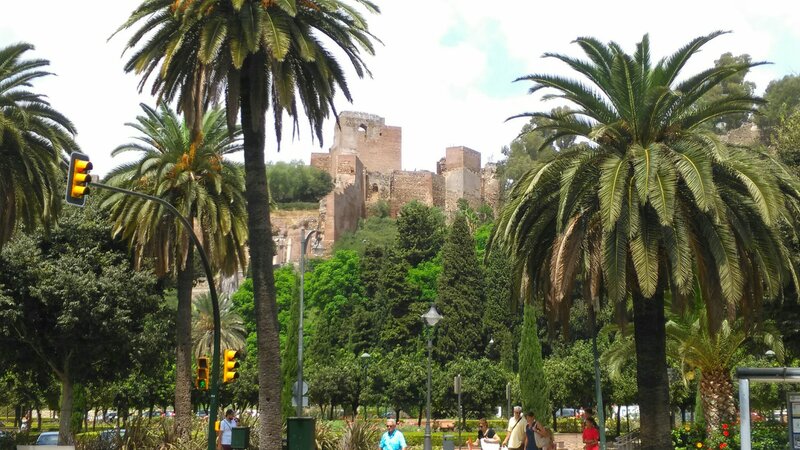 It was built in the 14th century to house troops and protect Alcazaba. From the walls you get spectacular views of the city. 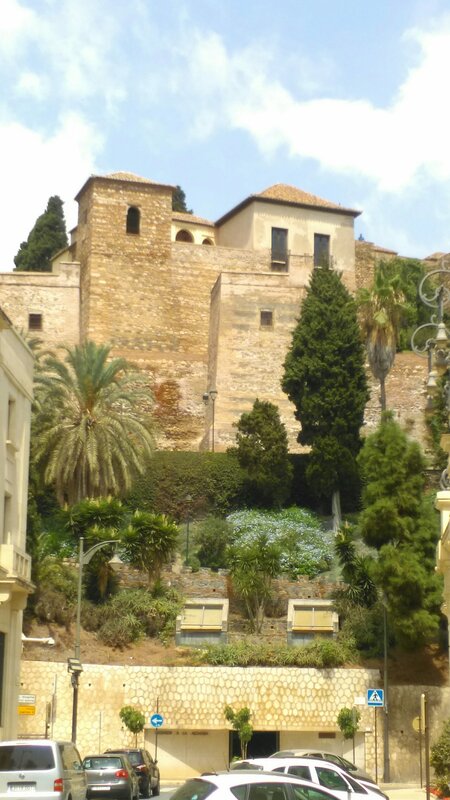 Alcazaba of Malaga is one of the iconic landmarks of Malaga. It was built in the 11th century during the Muslim period and is considered one of the most important Muslim world in Spain today. 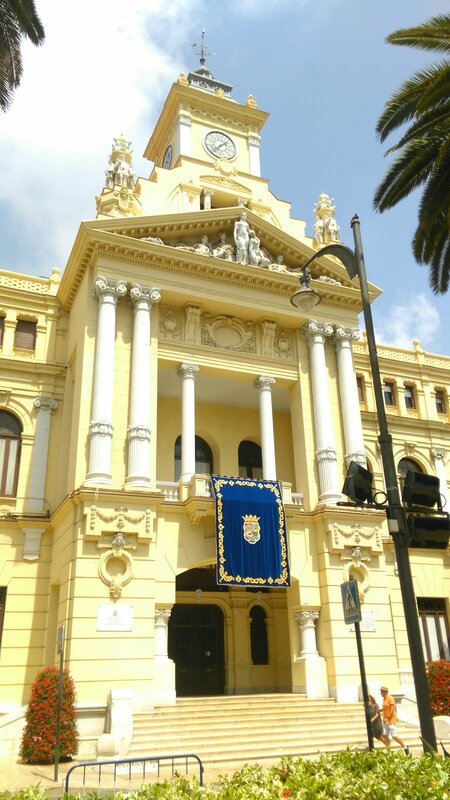 Moving on from there is Malaga’s Town Hall. 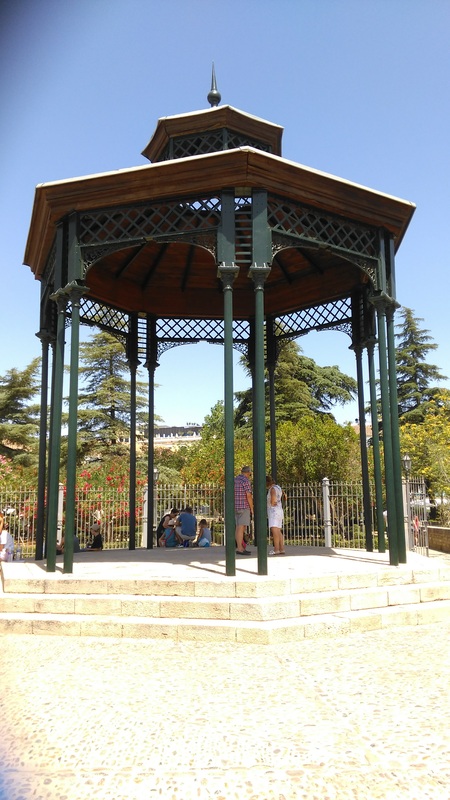 This was built between 1912 and 1919 and is one of the most remarkable modern buildings in Malaga. 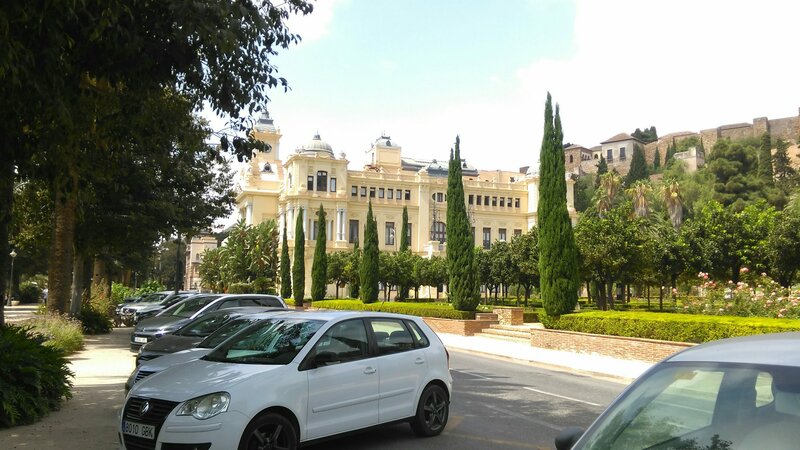 Lastly on my initial tour of Malaga is the Palacio de Aduana. This houses the works which were formerly in the Museo de Malaga. 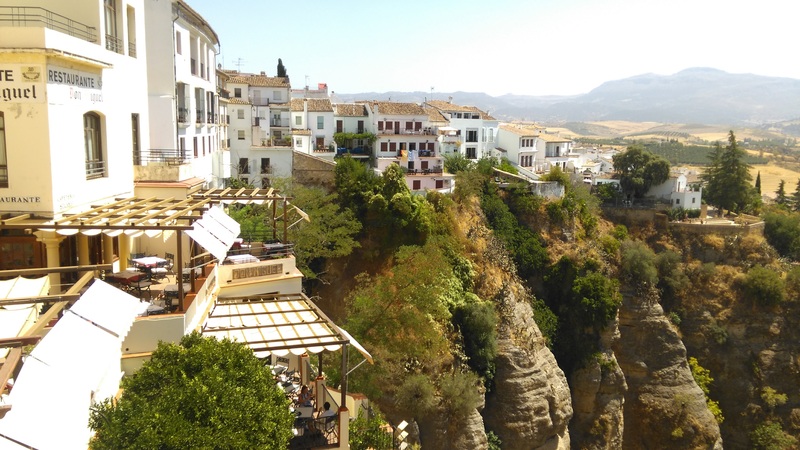 …..The 3rd most visited city in Andalusia is the beautiful mountaintop city of Ronda. 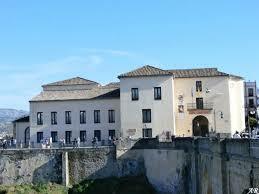 It is set above a deep gorge called El Tajo which separates the 15th century New town from the old historical town. 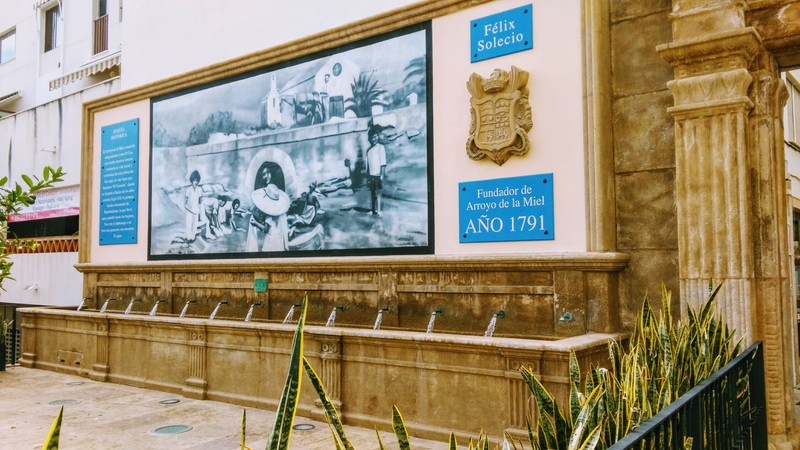 The old town is bisected from the New town by a stone bridge known as the Puente Nuevo (New bridge) It offers amazing photo opportunities from all angles. Modern Bullfighting originates in Ronda. The 18th century Bullring is now a museum and visitors are welcome to walk in the arena. Legendary bullfighter Pedro Romero from Ronda founded the style of bullfighting in which matadores fight bulls on foot rather than horseback. The bullring itself is one of the oldest in Spain. 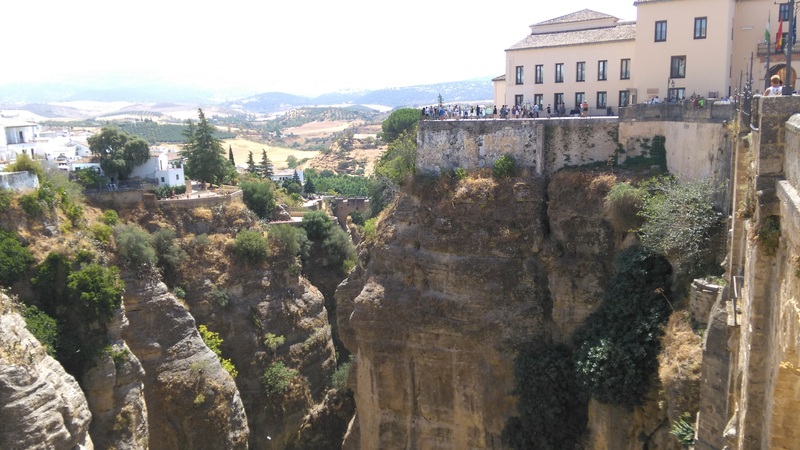 Ronda has many attractions and it’s hard to see them all and appreciate them in one day. 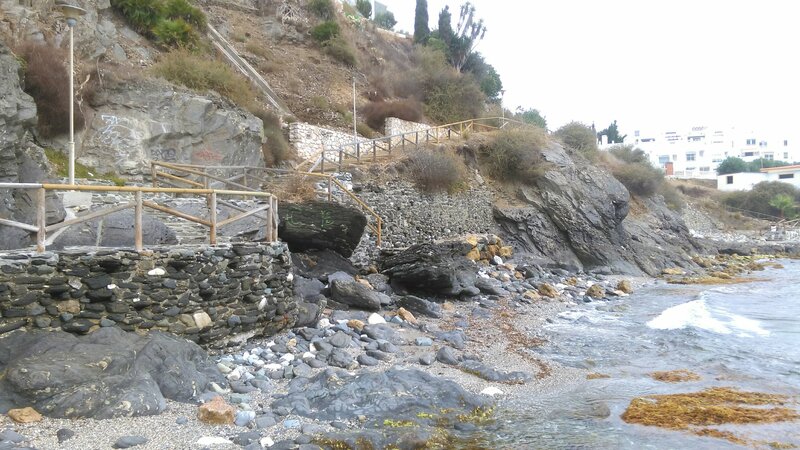 Balcony of Paseos – Walkways celebrating Ernest Hemingway and Orson Welles. 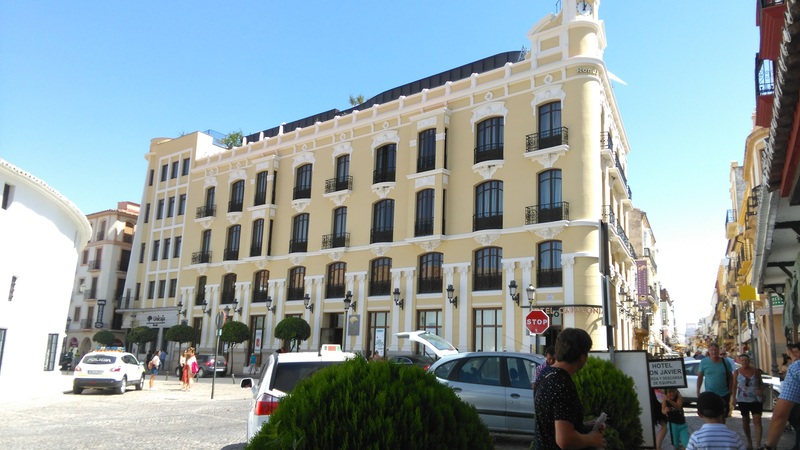 Palacio de Mondraga – A tiny palace. Its best feature is the remaining water gardens. 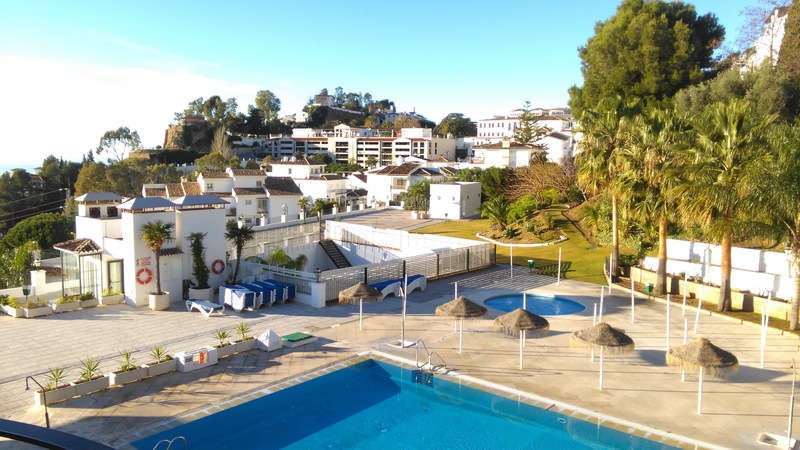 It has been heavily renovated and partly modernised. 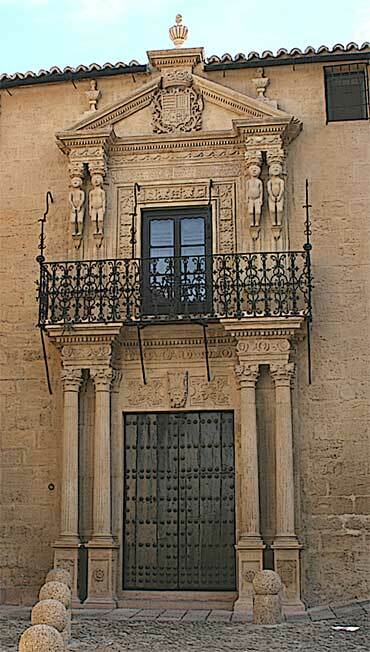 Casa del Rey Moro – House of the Moorish King which incorporates an important relic or Ronda’s Moorish occupation – The Water Mine. 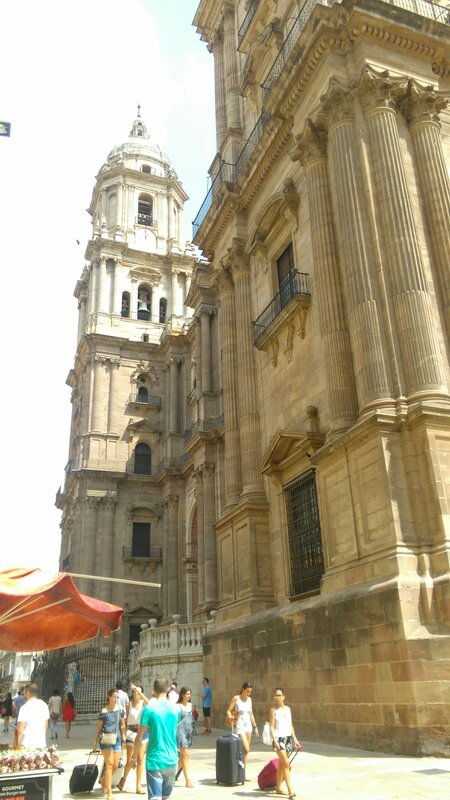 Iglesia del Espiritu Santo – An unofficial cathedral towering above the Almocabar Gate. 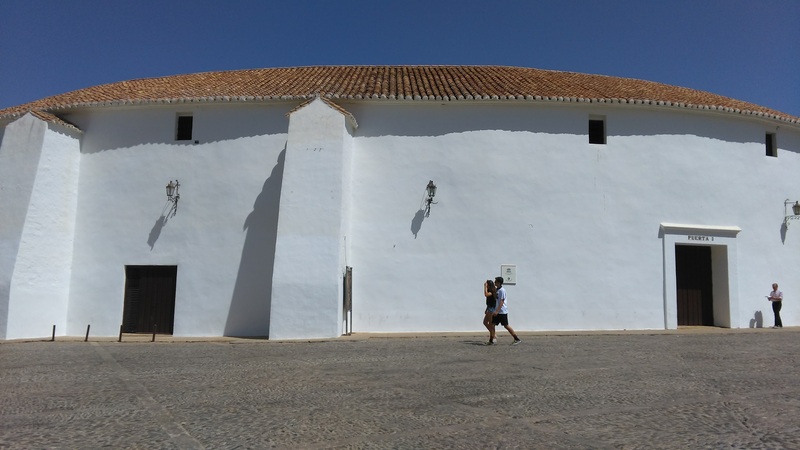 Convento de Santa Domingo – Built on Arabic foundations after the fall of Ronda. 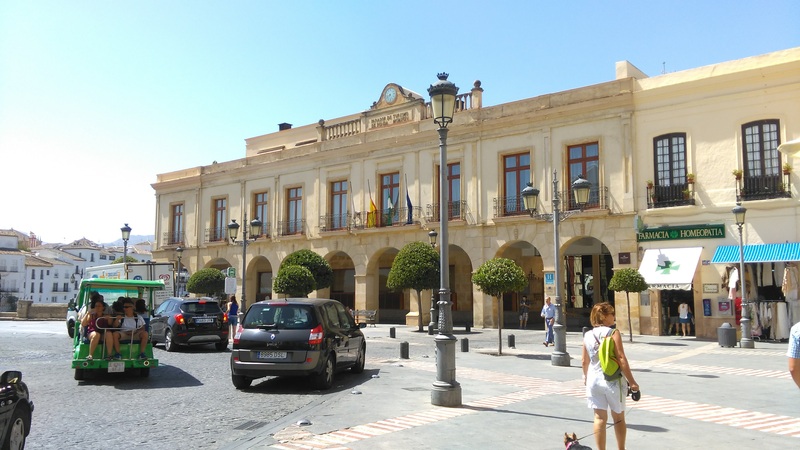 Palacio del Marques Salvaterra – A small museum of renaissance art and artefacts. 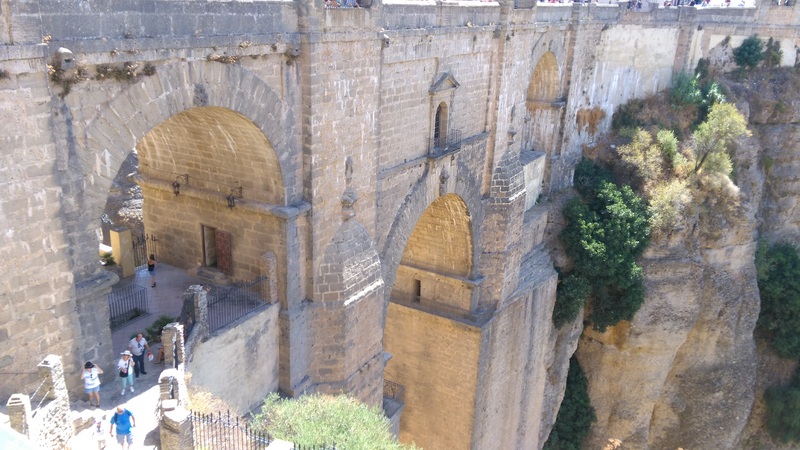 Puente Viejo – The only thoroughfare until Puente Nuevo was completed. 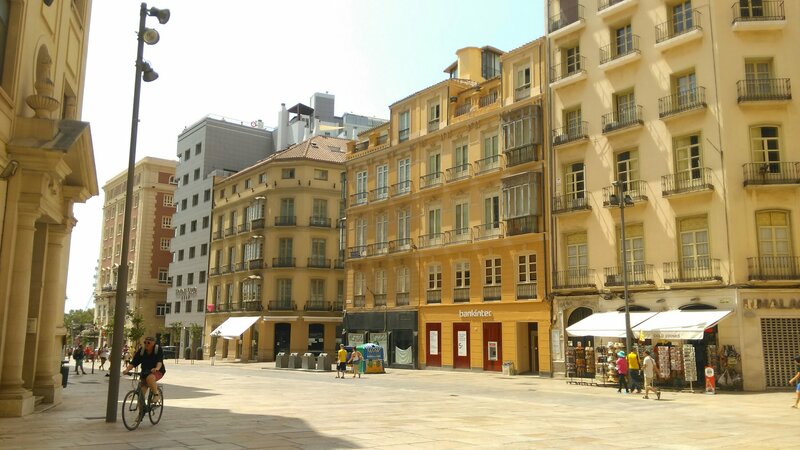 Plaza Duquesa de Parcent – Leafy square full of monuments. A truly beautiful public space. 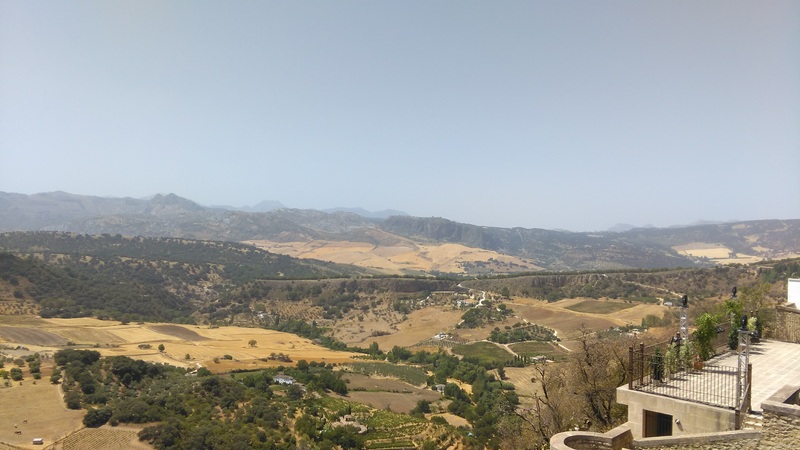 Just a few places to get you started on your tour of Ronda. A walking tour takes about 2-3 hours. Probably not advisable in the hotter months of the year. 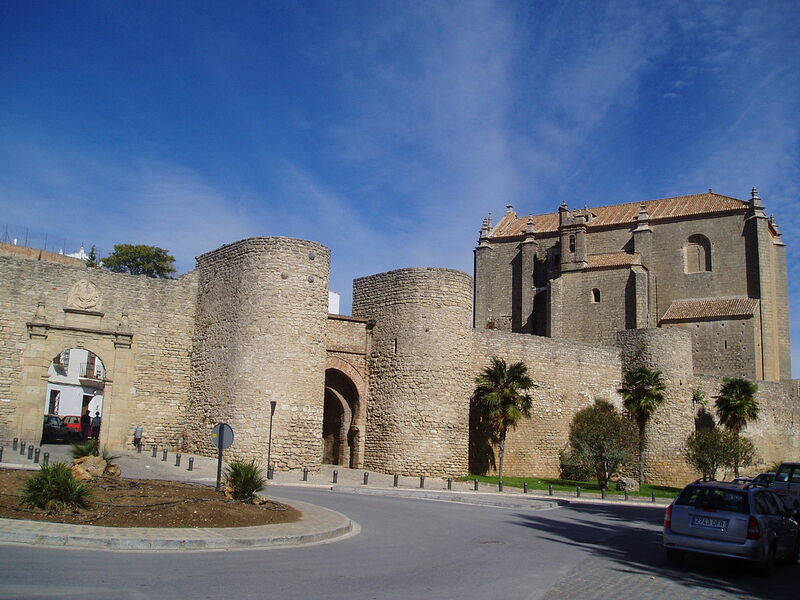 Everything you need to see is within 200-300 metres of the Puente Nuevo. 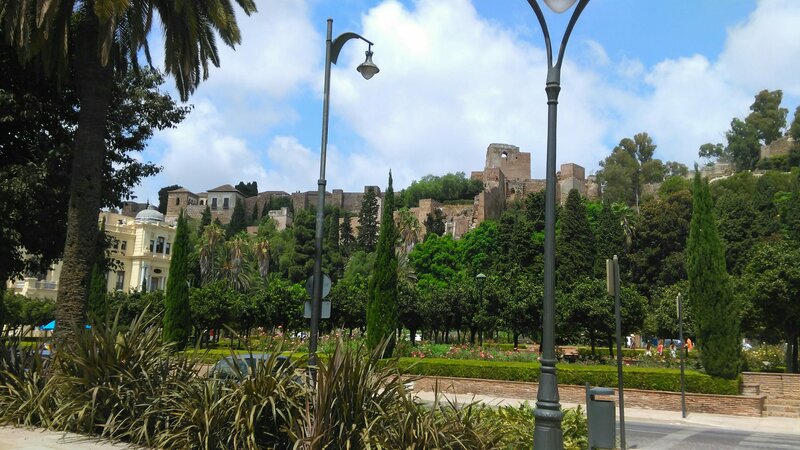 Ideally to appreciate Ronda in all its historical glory you need to spend 2-3 days in the city. 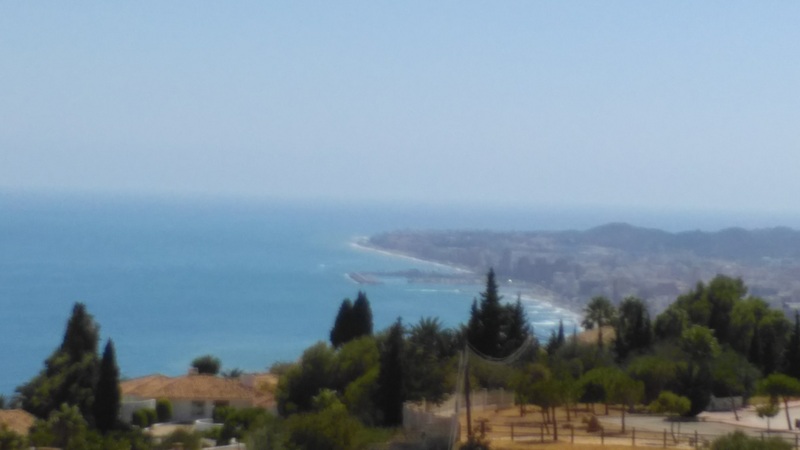 I have only lived here for a year but it doesn’t take long to appreciate the lifestyle you have in the Costa del Sol. One of the massive benefits is the 320+ days of Sun we have here. You can plan ahead and pretty much guarantee the weather will be anything but wet. The area I have lived in for the past year is quiet and tranquil and there are no boy racers charging past at all hours of the night. There are no drunken people walking past my window arguing. There is no continuous traffic streaming past my door. 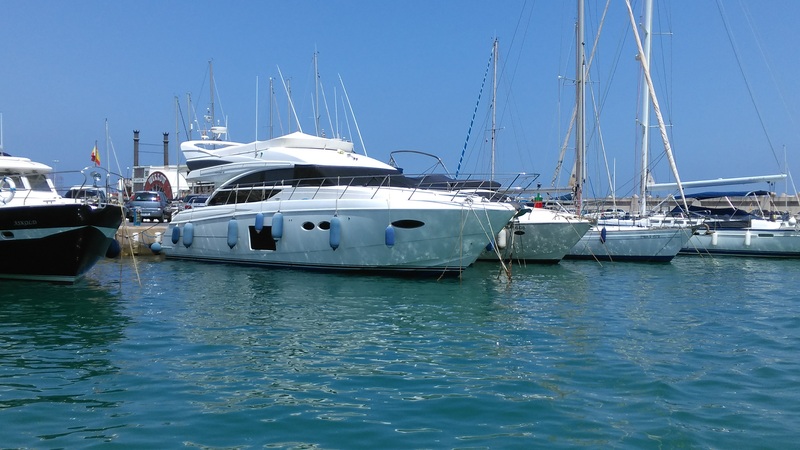 The lifestyle here is a expensive or inexpensive as you wish to make it. You control your own money and how and what you spend it on. You are surrounded by outdoor living. You can just go for a wander along the promenade, you can have a cheap day out at the beach. You can have lunch for 10€ for 2 people in some areas. You can just sit outside and read a good book or a blog, or even buy an English newspaper here. Children can play safer. The Spanish love children and dining out is never an issue if you have children as they are welcome anywhere. The days and nights are longer and you find yourself staying up later as this is normal. Dining late is normal, children up past 10pm is normal. We have been lucky enough to live in a villa this summer with a pool. My little boy has spent the summer learning to swim, something I would have never had time for in the UK , he is now a fully fledged water baby. I went out the other evening and walked from one town centre down to the coast line and walked along the promenade. Such a beautiful area, buzzing with life. 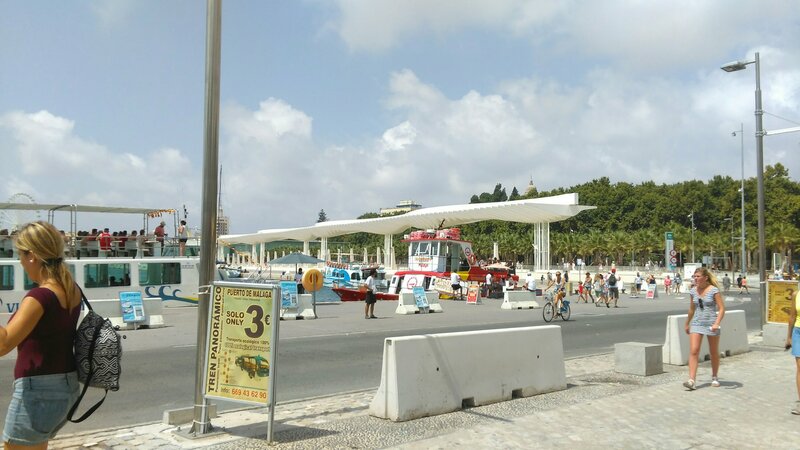 Plenty of shops and bars and ice cream parlours. We all commented how lucky we were to live in this lifestyle. To have the beach in our doorsteps, the good weather, the plentiful bars and restaurants and the safe environment for our children. We have visited most of the attractions in our area. Over the next couple of weeks we aim to venture further afield to see what’s new. 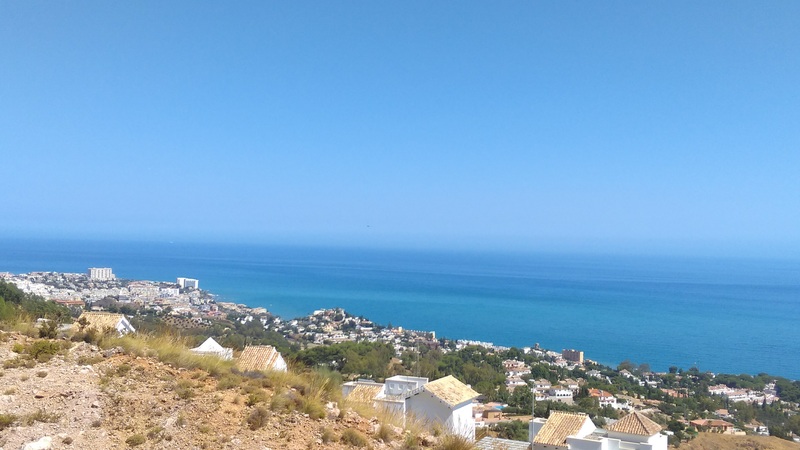 Ronda, Nerja and the all famous Smurf Village. 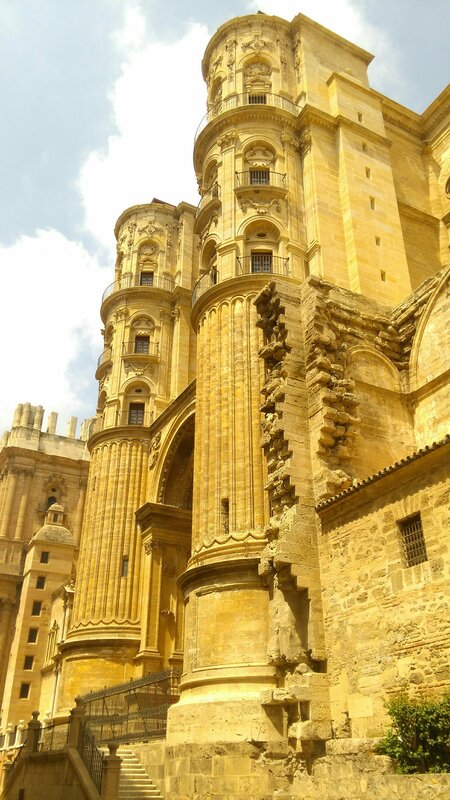 So many beautiful places to visit and then blog about so I can share my experiences. If you have any recommendations then please leave them in the comments.